Biltmore Industries is associated with the lives, work and ideals of Mr. and Mrs. George Vanderbilt and Fred L. Seely, all leading figures of 20th-century Asheville. The industries were established in 1901 under the patronage of George Vanderbilt and direction of his wife Edith, owners of the grand Biltmore Estate, to provide the youth of the Asheville area the opportunity "to become productive and useful citizens" through training in the creation of fine handmade crafts. The industries began in Biltmore Village with 12 young men and four years later, by 1905, had grown to 20 young men and women. The two main instructors at the start were Eleanor Vance and Charlotte Yale. Two of the buildings on the property are named after them. Woodworking was the initial focus of Biltmore Industries soon to be followed by the production of fine wool cloth. Woodworkers produced furniture such as the Windsor chair and made cabinets based on designs from pieces in the Vanderbilt's collection of Sheraton, Hepplewhite, Gothic and Chippendale furniture at the Biltmore House. Sheep were bred on the Biltmore Estate to provide wool for the Industries, wool that would eventually become famous for its quality and durability. George Vanderbilt passed away in 1914, and three years later Edith Vanderbilt sold the operation to Fred L. Seely, architect of the Grove Park Inn. 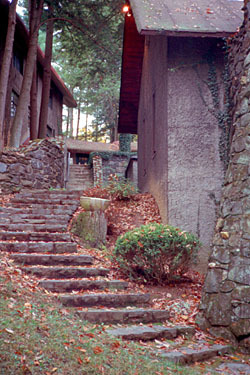 Seely began construction of seven buildings and shops adjacent to the Grove Park Inn that complimented its organic architecture. 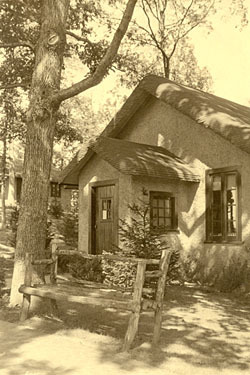 They form a compact grouping of cottage-like buildings with stuccoed walls, casement windows and broad sloping roofs that mimic those of the inn. The complex includes woodworking shops and facilities to handle all aspects of cloth production from receipt of raw wool to the retail sale of finished cloth. Seely further strived to accomplish Vanderbilt's goal of providing a good living for the members of the Industries together with an education in the traditional crafts. Common to all of the buildings is the presence of folk sayings, painted on walls or carved into doors or ceiling beams, which encourage the workers to give their best. Seely himself is quoted as saying, "Life without industry is guilt; industry without art is brutality." Biltmore Industries' fame for quality wool fabric extended to the American presidents. Coolidge Red was designed specifically for Mrs. Calvin Coolidge; and Hoover Gray was especially for President Herbert Hoover. Additionally, President Franklin Roosevelt was particularly fond of the Industries white wool fabric. A massive weaving loom was presented as a gift to the Roosevelts and Eleanor Roosevelt visited the shops in 1934. Though production has been cut back considerably over the past decades, Biltmore Industries still produces fine quality wool fabric using the original equipment and procedures established when the operation was moved to its present site in 1917. The Industries survive as a direct link to the Arts and Crafts movement of England and America during the 19th and early 20th centuries. With a renewed interest in handmade crafts, Biltmore Industries may again see a revival. Biltmore Industries is located at 111 Grovewood Rd., adjacent to the Grove Park Inn. Today, the buildings house craft and furniture showrooms, an antique car museum, artist studios, an art gallery, weaving and spinning rooms and a restaurant. Several of the buildings are open to the public during normal business hours. For more information, call 828-253-7651 or visit their website.